It seems like more and more big-budget game developers are ditching their cushy studio gigs and striking out on their own to make smaller, often more interesting games. I'm into it. 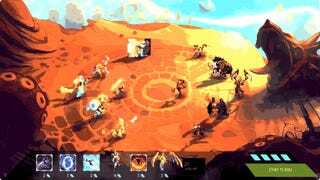 The latest of these is Duelyst, a self-described "tactical turn-based strategy game with ranked competitive play." Here's the new trailer, which shows off the game's lovely art more than anything else, but hey, it IS lovely art, so. The team, which is headed up by former Diablo III producer Keith Lee and Rogue Legacy artist Glauber Kotaki, has launched—naturally!—a Kickstarter campaign to raise money for development. They're already around halfway to hitting their relatively modest $68,000 goal. Duelyst is based on a tabletop board game, meaning that it's already got a solid set of rules behind it. The developers are also sure to stress that in the finished game, every unit and spell is earned by spending time playing the game, and it is "NOT pay-to win." Unfortunate title spelling notwithstanding, Duelyst sounds like another Kickstarter indie that knows what it wants to be, has a decent amount of steam already built up and hasn't come in with a hilarious budget, so I'd say it seems likely we'll eventually get to play it. I'd be all for another smart, turn-based Card Hunter/Banner Saga/Hero Academy-style PC game. Make it so, Internet.